In this paper I will be dealing with the ancient medical art of Acupuncture. Today in most western cultures it is considered a "new alternative" medicine. In reality Acupuncture (and its related Moxibustion) are practiced medical treatments that are over 5,000 years old. Very basically, Acupuncture is the insertion of very fine needles, (sometimes in conjunction with electrical stimulus), on the body's surface, in order to influence physiological functioning of the body. Acupuncture can also be used in conjunction with heat produced by burning specific herbs, this is called Moxibustion. In addition, a non-invasive method of massage therapy, called Acupressure, can also be effective. The first record of Acupuncture is found in the 4,700 year old Huang Di Nei Jing (Yellow Emperor's Classic of Internal Medicine). This is said to be the oldest medical textbook in the world. It is said to have been written down from even earlier theories by Shen Nung, the father of Chinese Medicine. Shen Nung documented theories about circulation, pulse, and the heart over 4,000 years before European medicine had any concept about them. As the basis of Acupuncture, Shen Nung theorized that the body had an energy force running throughout it. This energy force is known as Qi (roughly pronounced Chee). The Qi consists of all essential life activities which include the spiritual, emotional, mental and the physical aspects of life. A person's health is influenced by the flow of Qi in the body, in combination with the universal forces of Yin and Yang . (I will discuss Yin and Yang a little later). If the flow of Qi is insufficient, unbalanced or interrupted, Yin and Yang become unbalanced, and illness may occur. Qi travels throughout the body along "Meridians" or special pathways. The Meridians, (or Channels), are the same on both sides of the body (paired). There are fourteen main meridians running vertically up and down the surface of the body. Out of these, there are twelve organ Meridians in each half of the body (remember they are in pairs). There are also two unpaired midline Meridians. There will be a diagram of Acupuncture points for treating diseases of the Meridians at the end of the digestive system paper. (See Appendix 1). The acupuncture points are specific locations where the Meridians come to the surface of the skin, and are easily accessible by "needling," Moxibustion, and Acupressure. The connections between them ensure that there is an even circulation of Qi, a balance between Yin and Yang. Energy constantly flows up and down these pathways. When pathways become obstructed, deficient, excessive, or just unbalanced, Yin and Yang are said to be thrown out of balance. This causes illness. Acupuncture is said to restore the balance. Yin and Yang is an important theory in the discussion of Acupuncture treatment, in relation to the Chinese theory of body systems. As stated earlier Qi is an energy force that runs throughout the body. In addition, Qi is also prevalent throughout nature as well. Qi is comprised of two parts, Yin and Yang. Yin and Yang are opposite forces, that when balanced, work together. Any upset in the balance will result in natural calamities, in nature; and disease in humans. Yin is signified by female attributes, passive, dark, cold, moist, that which moves medially, and deficient of Yang. Yang is signified by male attributes, light, active, warm, dry, that which moves laterally, and deficient of Yin. Nothing is completely Yin or Yang. The most striking example of this is man himself. A man is the combination of his mother (Yin) and and his father (Yang). He contains qualities of both: This is the universal symbol describing the constant flow of yin and yang forces. You'll notice that within yin, there is Yang, and within Yang, there is the genesis of Yin. Whether or not you believe in Taoist philosophy, (which all this is based on), one thing is indisputable: Acupuncture works. 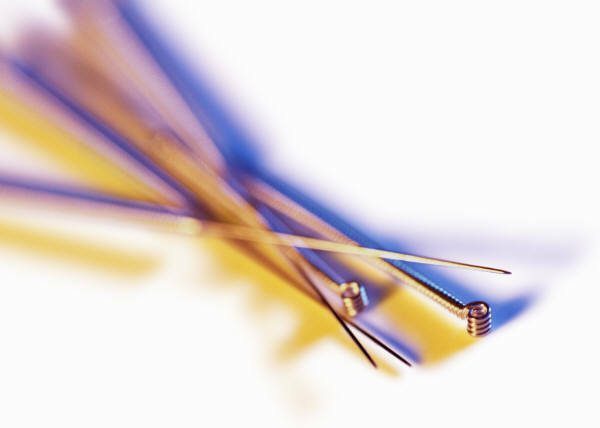 Acupuncturists can use as many as nine types of Acupuncture needles, though only six are commonly used today. These needles vary in length, width of shaft, and shape of head. Today, most needles are disposible. They are used once and disgarded in accordance with medical biohazard regulations and guidlines. There are a few different precise methods by which Acupuncturists insert needles. Points can be needled anywhere in the range of 15 degrees to 90 degrees relative to the skin surface, depending on the treatment called for. In most cases, a sensation, felt by the patient, is desired. This sensation, which is not pain, is called deqi (pronounced dah-chee). The following techniques are some which may be used by an Acupuncturist immediately following insertion: Raising and Thrusting, Twirling or Rotation, Combination of Raising/Thrusting and Rotation, Plucking, Scraping (vibrations sent through the needle), and Trembling (another vibration technique). Once again, techniques are carefully chosen based on the ailment. Another popular treatment method is Moxibustion, which is the treatment of diseases by applying heat to Acupuncture points. Acupuncture and Moxibustion are considered complimentary forms of treatment, and are commonly used together. Moxibustion is used for ailments such as bronchial asthma, bronchitis, certain types of paralysis, and arthritic disorders. Cupping is another type of treatment. This is a method of stimulating Acupuncture points by applying suction through a metal, wood or glass jar, in which a partial vacuum has been created. This technique produces blood congestion at the site, and therefore stimulates it. Cupping is used for low backache, sprains, soft tissue injuries, and helping relieve fluid from the lungs in chronic bronchitis. One of the most popular alternatives to Acupuncture is Acupressure. This is simply Acupuncture without needles. Stimulation of the Acupuncture points is performed with the fingers or an instrument with a hard ball shaped head. Another variation of Acupressure is Reflexology (also called Zone Therapy). This is where the soles of the feet and the posterio-inferior regions of the ankle joints are stimulated. Many diseases of the internal organs can be treated in this manner. The question arises, how does Acupuncture work? Scientists have no real answer to this; as you know many of the workings of the body are still a mystery. There are a few prevailing theories. By some unknown process, Acupuncture raises levels of triglycerides, specific hormones, prostaglandins, white blood counts, gamma globulins, opsonins, and overall anti-body levels. This is called the "Augmentation of Immunity" Theory. The "Endorphin" Theory states that Acupuncture stimulates the secretions of endorphins in the body (specifically Enkaphalins). The "Neurotransmitter" Theory states that certain neurotransmitter levels (such as Seratonin and Noradrenaline) are affected by Acupuncture. "Circulatory" Theory: this states that Acupuncture has the effect of constricting or dilating blood vessels. This may be caused by the body's release of Vasodilaters (such as Histamine), in response to Acupuncture. One of the most popular theories is the "Gate Control" Theory. According to this theory, the perception of pain is controlled by a part of the nervous system which regulates the impulse, which will later be interpreted as pain. This part of the nervous system is called the "Gate." If the gate is hit with too many impulses, it becomes overwhelmed, and it closes. This prevents some of the impulses from getting through. The first gates to close would be the ones that are the smallest. The nerve fibers that carry the impulses of pain are rather small nerve fibers called "C" fibers. These are the gates that close during Acupuncture. "...one of the factors contributing to motor recovery is almost certainly the activation of spindle cells. They are stimulated by Gamma motor neurons. If Acupuncture stimulates the Gamma motor neurons, the discharge causes the contraction of Intrafusal Muscle fibers. This activates the Spindle cells, in the same way as muscle stretching. This will bring about muscle contraction." There are many diseases that can be treated successfully by Acupuncture or its related treatments. The most common ailments currently being treated are: lower backache, Cervical Spondylosis, Condylitis, Arthritic Conditions, Headaches of all kinds (including migraine), Allergic Reactions, general and specific use for Analgesia (including surgery) and relief of muscles spasms. There have also been clinical trials in the use of Acupuncture in treating anxiety disorders and depression. Likewise, very high success rates have been found in treating addictions to alcohol, tobacco (nicotine) and "hard' drugs. Acupuncture can rid the body of the physical dependency, but can not rid the mind of the habit (psychological dependency). For this reason, Acupuncture treatment of addictions has not been fully successful. Obviously, especially for a paper such as this, my research would not be complete without backing it up with some case studies. Here they are. The National Institute on Drug Abuse (NIDA) has sponsored three studies examining the effectiveness of Acupuncture for the treatment of substance abuse. The first was at the Lincoln Medical Medical Center in Bronx, NYC, New York. It was headed by Dr. Douglas Lipton, and completed in 1991. This study used Auricular Acupuncture on Crack Cocaine users. The study was split into groups, one getting the correct Acupuncture treatments, the other getting "placebo" Acupuncture (needles placed in the "wrong" spots). Urinalysis results showed that the subjects receiving the correct treatments had lowered their use of the drug, in as little as two weeks. This was verified by testing for cocaine metabolite levels. However, the reduction was not as significant as had been anticipated. *Note that no other type of treatment, such as counseling as given. In two other studies currently going on, (the first by Dr. Janet Konefal of Miami School of Medicine; and the other by Dr. Milton Bullock at the Hennepin County Medical Center in Minneapolis), counseling combined with acupuncture is being tested. The preliminary results have been quite promising. Additional studies, too numerous to mention here have proven the effectiveness of Acupuncture therapy in Nicotine addiction, (look in Bibliography for some case citings). Between 1971 and and 1972 a series of doctors (Frank Z. Warren: New York University Medical Center; Pang L. Man and Calvin H. Chen: Northville State Hospital, Northville, Michigan), conducted seven surgeries at both Northville State Hospital and at Albert Einstein Medical Center. they used both standard Acupuncture and Electro-Acupunture techniques. They found that in all cases of surgery (six invasive and one dental) these Acupuncture treatments were successful in stopping the pain of surgery without additional anesthetics. In only one case (a repair of an inguinal hernia) did the patient complain of "discomfort;" and only in one additional case did a patient (the same one) complain of post-operative pain. In conclusion, I feel that Acupuncture should be considered a valid form of treatment alongside, not only other "alternative" forms of treatment, but also along side mainstream medicine. More and more insurance companies are discovering the cost effectiveness of Acupuncture. Unfortunately, many insurance companies still do not cover Acupuncture therapy, with the exception of Drug Addiction treatments; and then only if other therapies have been unsuccessful, or as part of another program. Part of the reason for this is that as of the writing of this paper, the Food and drug Administration classifies Acupuncture needles as "investigational" devices. However, since this paper was written, the FDA has reclassified acupuncture needles and so, now, one great block to insurance coverage has been removed. Acupuncture Doctors are licensed independently in most states while some states require you to be a Medical Doctor to practice Acupuncture. Acupuncture schools are federally accredited by the ACAOM (Accreditation Commission for Acupuncture and Oriental Medicine). This accreditation allows the school to offer federal guaranteed student loans. Baxi, Dr. Nilesh and Dr.CH Asrani. Speaking of: Alternative Medicine: Acupuncture. New Dehli, India: Sterling Publishers Private Ltd, 1986. Duke, Marc. Acupuncture. New York: Pyramid House Books, 1972. Holden, Constance. "Acupuncture: Stuck on the Fringe." Science, May 6, 1994, pg 770. Lever, Dr. Ruth. Acupuncture For Everyone. Middlesex, England: Penguin Books, Ltd, 1987. Lipner, Maxine. "Different Strokes." Women's Sports and Fitness, May/June, 1993, pg 31, 32, 85. Moss, Dr. Louis. Acupuncture And You: A New Approach To Treatment Based On The Ancient Method of Healing. London, England: Elek Publishers, 1972. Nightingale, Michael. The Healing Power of Acupuncture. New York: Sterling Publishing Co. Inc, 1986. Ponce, Pedro E. "Eastern Medicine Collides with Western Regulations at Mass. Acupuncture School." The Chronicle of Higher Education, October 27, 1993, pg A32. Saslow, Linda. "Scores of Students Take Up Acupuncture at Center in Syosset." New York Times, November 6, 1994. Warren, Dr. Frank Z. Handbook of Medical Acupncture. New York: Van Nostrand Reinhold Co., 1976. Dr. Douglas Lipton:"Lincoln Clinic Study"; Dr. Janet Konefal:"Miami Study"; Dr. Milton Bullock: "Hennepin County Study." U.S. Department of Health & Human Services, National Institutes of Health, Office of Human Services, AM, Volume 1, Number 3, January, 1994. Brewington, Vincent, et al. "Acupuncture as a Detoxification Treatment: An Analysis of Controlled Research." Journal of Substance Abuse Treatment, Volume 11, Number 4, 1994, pg 289-307. Dr. Thomas Barba, Barba Chiropractic Clinic; Columbus, Ohio. Nigel Dawes, Co-Director of the School for Oriental Medicine; Syosset, New York. Dr. Gerard O'Grady; Lake Grove, New York. ......... for all your help and information.